You can get the magazine in 2 formats. In electronic or printed for your pleasure. Check out the Hola Sweepstakes and Specialty Photos. Fun was had by all! We placed this link up here as we have had a number of people that want to download the free video on grooming that Darlah did. It's her first attempt to share and as time goes on she will evolve and perfect but till then, here it is. After numerous requests, our new printed version is now available. Click here. 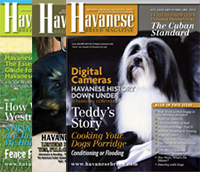 We are pleased to announce the availability of the print version of The Havanese Breed magazine. That's right, it is also now IN PRINT! An annual subscription for the print version of The Havanese Breed magazine is $89.95, which includes shipping and handling in continental North America. International postage to Europe, Australia or New Zealand is an additional $30 a year. The magazine will continue to be published bi-monthly. For those of you that wish an annual subscription, please click on the button below to order it now! *The prices below in the drop down menu DO include all shipping and handling costs. There are two choices; first for US/Canada, the second for International. Issue #37 of The Havanese Breed magazine can be purchased now for $15.95 including shipping and handling in North America. The cost for international locations is $21.95 including shipping and handling. Please click on the drop down menu below and select your location then click on the 'buy now' icon to order your copy now! Published bi-monthly, your annual subscription rate for 6 issues per year is $39.95. Subscribe here. For those of you that began your subscription now, back issues #14 through #36 are available in PRINT for a nominal fee. Join with us on our journey. Remember, I can't do it without your support. This magazine is for you, the greater Havanese community. Subscribe, advertise, join us. The Havanese Breed magazine is devoted to the breed, and remains independent of any club. Every month we bring you great articles, information, advice, humor, and guidance on a wide variety of subjects, concerns, training, nutrition, breeding, care, shows and products from a half a dozen countries all a part of the greater Havanese community. Share in the love! Please join us now and subscribe today. Our focus is on you, the Subscribers. I can’t say this enough. Please support the magazine and help us support the greater Havanese community by clicking on the SUBSCRIBE button that you desire, right now. Thank you. Above all, enjoy the read! The deadline for article and advertisement submissions for the next edition is April 15th. Copyright © 2012, Havanese Breed Magazine. All rights reserved.